Do you have a little mechanical designer on your hands? One who seems to be headed for a career in engineering? Those who create mechanical drawings should have skills in handwriting small, clear precise letters. I didn't make these printables for that purpose though. I made them because eventually, or even from the beginning, children will need to be able to write using small letters, and then there are some children who just prefer to write using small handwriting. Each lesson has 4 sections. Each section could be completed each day, 4-days a week. A schedule for that would be, print one file for each week and have the child complete one section each day, 4 days a week. The files on this page use the font Print Clearly that resembles Zaner Bloser. I made the lessons in a paint program because print clearly does not have the ruled lines with each letter. 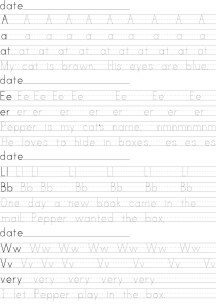 If you want to make lessons similar to these, try the Penmanship Print font in your word processor. I wrote an article about using the Penmanship Print font at Homemade Manuscript Handwriting Lessons. These are rather random. I'll add more when I have time. One of Donna's Menu Planner in two colors - black and white, and blue and white. This planner allows you to keep a running record of meals and it has the typical menu planner files to go with it. Part of this menu planner is based on my category method of making meal plans.